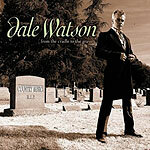 CD review: "From the Cradle to the Grave"
Dale Watson, perhaps due to lack of competition as much as his own single-minded devotion to the cause, is assuming Johnny Cash's role as the conscience of country music. Both in his willingness to tackle subjects other than broken hearts and in his fealty to the rural roots of the music, Watson hews far closer to Cash's example than to the pop-rock coming out of Nashville under the country banner these days. The 10 tracks on his latest release, "From the Cradle to the Grave," are classic bits of trad country coupled to an active philosophical mind, nine of them freshly minted from Watson's own pen. From the opening track, questioning those who oppose the death penalty, to the closing track about the costs of a hot temper, Watson writes lyrics more often associated with folk than country. But the music itself is purest honky tonk, albeit more Bakersfield than his adopted Texas, and Watson's singing is equally twangy. Those who grew up on Cash and Waylon and Willie and wondered when country music ditched the pickup for an SUV are likely to find Dale Watson's traditional yet never hidebound approach a refreshing change of pace.